The celebrated city of Agra contains India’s most enduring icon, the Taj Mahal. Though a commercial and religious center for 3000 years the city was truly created by the Mughals. The story of Agra is primarily the story of its emperors. When the first Mughal conquerer, Babur came here from Kabul he sorely missed the mountains and the waters of Afghanistan, so he transformed these lands into beautiful quartered gardens with fruit trees, lily ponds and cascading water running into channels. The successive generations of Moghul emperors added to Agra’s charms, Akbar gave it the labyrinthine Agra Fort and built the nearby city of Fatehpur Sikri. Queen Nur Jahan designed the delicate mausoleum of Itmad-ud-Daula. Emperor Shah Jahan however was the builder extraordinaire and the creator of the Taj Mahal. The city with all its many charms, rich atmosphere and legendary history is a huge draw for tourists. Amidst the architectural marvels of Agra at Japyee you also get to experience life in a palace as it is a perfect combination of traditional Mughal architecture and luxurious amenities. This 5 star haven is set amidst 25 acres of landscaped gardens, with lined walkways and dancing fountains. The hotel Jaypee Palace Agra has 350 guest rooms, 12 of these are suites and 40 are executive rooms. All the rooms are elegantly decorated and superbly comfortable, each of them includes tea/coffee maker, iron and iron board, electronic door lock, minibar, individual safe, direct dial telephone, color television, free morning newspaper, wake up facility and evena sewing kit. Dining options at Jaypee Palace range from the Pavilion Café, which is the 24-hour coffee shop, it serves Indian and Continental delicacies. For Awadhi cuisine, Spice Pavilion is the place to visit. On The Rocks is the bar at the hotel that serves exotic cocktails and drinks. The Tea Lounge, Deccan Pavilion and Poolside Bar are other dining options at the hotel. The hotel also has a Convention Center with a total floor area of 6770 square meters, it is equipped with comfortable seating, natural lighting state-of-the-art audio/video facilities. Within the hotel is the wonderfully affective “Sansha Ayurvedic Health Spa”, its a sanctuary of indulgence, luxury and complete holistic rejuvenation. For leisure and recreation the hotel has a swimming pool located amidst pergolas and exotic flower beds, health club with gym, jacuzzi, Turkish bath, aerobics room, beauty parlour, barber shop, billiards, table tennis room, lawn tennis and squash courts, putting greens, joggers track and a discotheque, the leisure mall includes a bowling alley, electronic and virtual reality games and children's play stations. It is located in the main tourist district of Agra, on Fatehabad Road. At a 2 hr. distance from Delhi by Train 3 hours by road. 10 Kms from Kheria (Agra) Airport. 8 Kms. from Agra Cantt. Railway station. Located just 600 meters away from the Taj Mahal the The Oberoi Amarvilas offers incredible views of the Taj. The hotel also belongs to the Oberoi Group of Hotels. 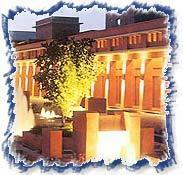 Its verdant Mughal gardens, terraced lawns, fountains, pavilions and pools are a hallmark of its classical architecture.